ALL Thompson Center Venture Rifles manufactured prior to October 28, 2011. During an internal technical review, Smith & Wesson identified a condition that may exist with the sear supplied with some rifles that would allow the rifle to fire without the trigger being pulled. In the interest of consumer safety, we are initiating this recall to allow for the prompt inspection and, if necessary, the repair of each rifle. This broadens the recall announced by Smith & Wesson on November 8, 2011. This recall applies to ALL Venture rifles manufactured prior to October 28, 2011. To determine if your rifle is affected, please reference the serial number list located at the link below. If your serial number does not fall within the list of affected serial numbers, your rifle is not part of this recall. Any unintended discharge of a firearm has the potential to cause injury or death, and we ask that you stop using your rifle until we have an opportunity to inspect the sear to make certain that there is no condition which will allow the rifle to fire without the trigger being pulled. To facilitate the inspection and, if necessary, repair of your rifle, please contact Smith & Wesson’s customer service department to receive instructions and a prepaid return label for the return of your rifle to Smith & Wesson. 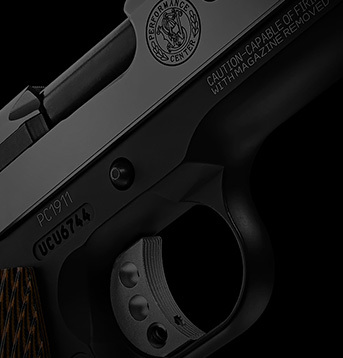 When you return your rifle to Smith & Wesson, be sure to attach the completed information card received from Smith & Wesson, so that your rifle can be returned to you as quickly and efficiently as possible. 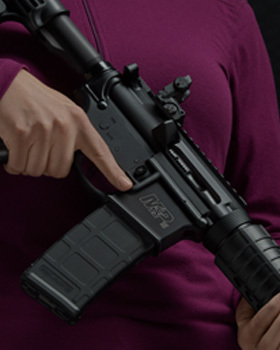 When your rifle sear is returned, you should note a punch dot on the trigger assembly. See the photograph below. This punch dot is confirmation that your sear has been inspected and the hazard has not been found or has been corrected. When you rifle sear is returned, you should also note a red checkmark on the label on the outside of your box. See the photograph above. This checkmark is further confirmation that you sear has been inspected and the hazard has not been found or has been corrected. 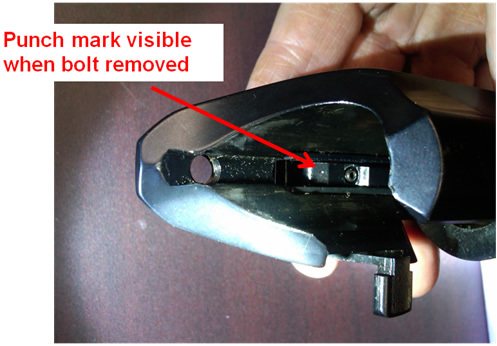 To receive a FedEx pre-paid label and shipping instructions to arrange for the modification of your Venture Rifle email us at venturerecall@smith-wesson.com or call us at 1-800-331-0852 to arrange for the inspection and repair, if necessary, of your rifle.